Last night we had leftovers, and I had plans for Wednesday night for dinner in the city with my girlfriend and so I wanted to leave a quick dinner for my husband to heat up when he got home from work since I would be out. So I wanted to try a new recipe I had come across on one of my favorite bloggers blog (http://fortheloveofcooking-recipes.blogspot.com/). This way I could have his dinner all made and extra to bring to work for my lunch today! This is super quick and the flavors and textures really give this meal a unique bite! Heat the olive oil in a large sauce pan over medium heat. Add the rice and cook for 1 minute; add the minced garlic then cook, stirring frequently for 1 minute, being careful not to burn the garlic. Add the chicken broth and season the water with a bit of sea salt and pepper, to taste; bring to a boil. Cover, reduce heat, and cook over medium low for 20 minutes. Remove from heat and don't touch for 5 minutes. Add the green onions and mix until well combined. Serve immediately and Enjoy. heat medium sautee pan on medium-high heat. when a drop of water sizzles on the pan, drop the chicken and let cook for about 45 seconds and then stir. Continue to cook for about 3 minutes until chicken is done. 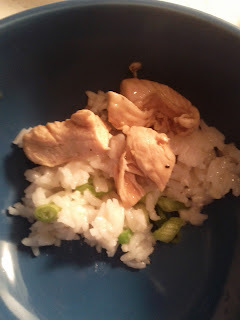 Serve the garlicky rice in a bowl with chicken on top and drizzle with the sauce left in pan and wallah! Quick dinner in 20 minutes! I am so glad you liked the rice... we loved it. Thanks for the shout out and link.